Jean and Harrison Horblit were collectors and philanthropists who made often incalculably valuable contributions to many organizations — including those interested in the history and conservation of Ridgefield. A widely known and respected collector of antique books and manuscripts, Harrison D. Horblit was born in Boston in 1912, graduated from Harvard in 1933 and became a textile executive. But his avocation as a collector made him known around the world. His specialty was antique books and manuscripts related to the history of science, mathematics and navigation, and his own book, “One Hundred Books Famous in Science,” is still considered a bible in its field. Much of his collection of rare books and manuscripts, including many items from the 1400s and 1500s, was donated to Harvard's Houghton Library. After his death, Jean Horblit catalogued and then gave his large collection of 19th Century photographs, including 3,141 daguerreotypes and 3,100 paper prints from as early as 1839, to Houghton where it is now The Harrison D. Horblit Collection of Early Photography. Mr. Horblit was also interested in local history. In 1973, when a group of Ridgefielders tried to buy a 1780 English print of the Battle of Ridgefield at a Sotheby's auction, they quickly ran out of money. Mr. Horblit stepped in and eventually paid $16,000 for an item Sotheby's had valued at under $2,500. “This print belongs in Ridgefield if it belongs anywhere,” Mr. Horblit said at the time. Three months after his death in 1988, Mrs. Horblit donated the print to the Keeler Tavern Museum. Jean Mermin Horblit was born in 1910 in New Haven, where she grew up and was the 1927 Connecticut High School shorthand champion. She studied at Columbia University and became the head of fabric designs for a division of Marshall Field & Company. It was there that she met her husband; they were married in 1952. She was a collector of antique Japanese woodblock prints, illustrated books and maps known as Ukiyo-e or “images of a floating world,” which cover scenes from everyday life of the people. Her prints and books have been exhibited at the Hammond Museum, Princeton University, and Katonah Gallery, and a rare 17th Century map of Tokaido was shown at the New York Museum of Natural History. She also donated pieces of their collections to the Metropolitan Museum of Art. 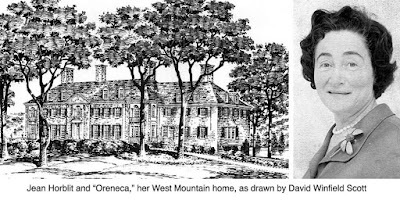 Mrs. Horblit had been a major benefactor of the new Ridgefield Historical Society and its efforts to restore the Scott House as its headquarters. She also donated 22 acres of her estate bordering Round Pond to the Land Conservancy of Ridgefield. The Horblit home itself, a magnificent English Georgian-style mansion that had been meticulously maintained by Mrs. Horblit, is an important piece of Ridgefield history. Built in 1930 from limestone imported from France, “Oreneca” was all but abandoned by its owner, Philip D. Wagoner, after the death of his wife a few years later. When the Horblits bought the place in 1965, the property was so overgrown they did not know the house overlooked nearby Round Pond. Avid yachters, Jean and Harrison Horblit sailed the Maine Coast for two months every summer for many years. Jean Horblit moved to Stonington in 2004 and died in 2009 at the age of 98.